The ingredient list may be long, but the preparation of this roasted cod with Montpellier butter recipe is quite effortless. This particular recipe has a twist: drizzling the cod with a wine reduction after cooking it. 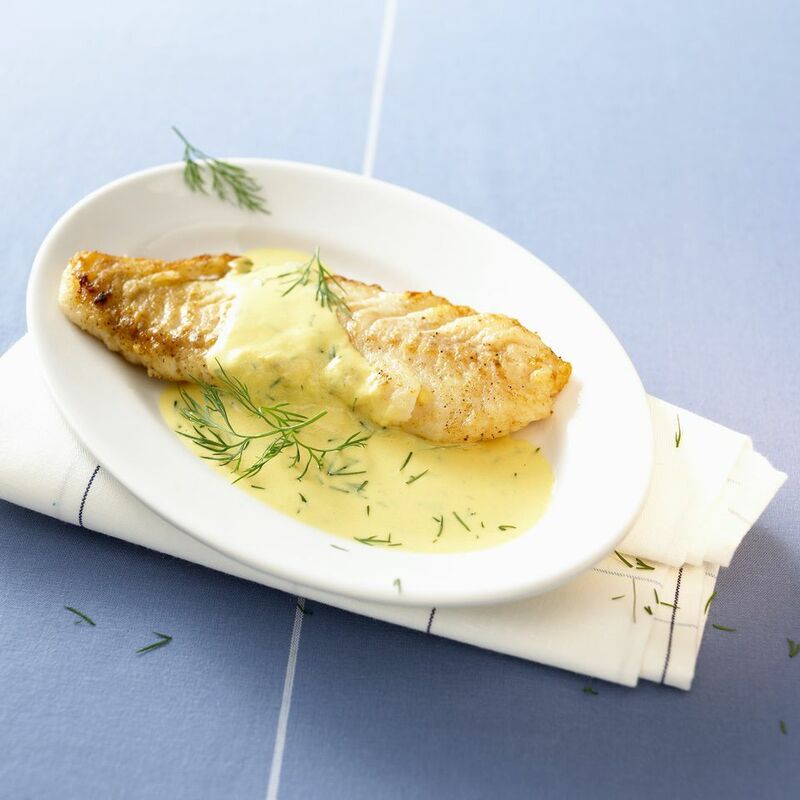 The butter is something of an herb-laced, eggless mayonnaise perked up with cornichons and anchovies; it tastes fantastic served as a garnish to quickly roasted cod fillets. Serve the dish with fresh salad greens, the whole meal, is very appealing to the palate served with a crisp, dry white wine. Layer the fresh thyme and marjoram in a metal baking pan and set it aside for a moment. Brush the cod fillets with olive oil and dust them with the salt and pepper. Place the seasoned cod on the fresh herbs, loosely cover the dish, and chill the fish, turning once, for 90 minutes. While the cod is marinating, make the herb butter. Using a food processor, blend the anchovies, cornichons, capers, and garlic until the mixture is smooth. Add the softened butter, and process until the mixture is completely smooth. Add the prepared watercress, parsley, spinach, and chervil and pulse the butter until the greens are just finely chopped, not fully pureed. With the processor blades on, slowly and evenly pour in the olive oil, mustard, lemon juice, salt and pepper. Set the Montpellier butter aside for a moment. For the best flavor, roast the fish right before serving the dish. Preheat the oven to 450F. Uncover the baking dish and roast the cod and herbs for 9 minutes. Turn the fish over and continue roasting ti for an additional 9 minutes. The fish should be firm and easily flaked with a fork when done. Large fillets can be cut on the diagonal to make smaller servings, if desired. While the cod is cooking, reduce the wine by half in a small pan. Layer a large serving platter with fresh salad greens and roasted cod. Drizzle the wine reduction over the cod and then garnish the fish with herb butter on the side. This roasted cod with herb butter recipe makes 4 to 6 servings.